While USD is getting weak after President Trump’s comments, GBP will be massively under the influence of UK’s public sector net borrowing for July and CBI industrial trend orders. 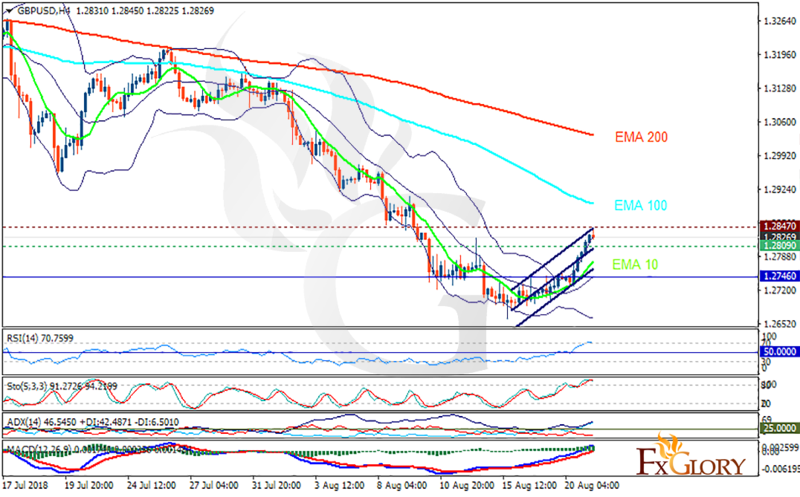 The support rests at 1.28090 with resistance at 1.28470 which both lines are above the weekly pivot point at 1.27460. The EMA of 10 is moving with bullish bias in the ascendant channel and it is below the EMA of 200 and the EMA of 100. The RSI is moving in overbought area, the Stochastic is moving in high ranges and the MACD line is above the signal line in the positive territory. The ADX is showing buy signal. The price has already reached the upper Bollinger band therefore there is a high possibility that GBPUSD start its decline and fall towards 1.274. The resistance level breakout might push the price up as well towards 1.29.